Big investors including the Massachuetts pension fund and State Street Global Advisors are pushing companies they invest in to diversify their boards. 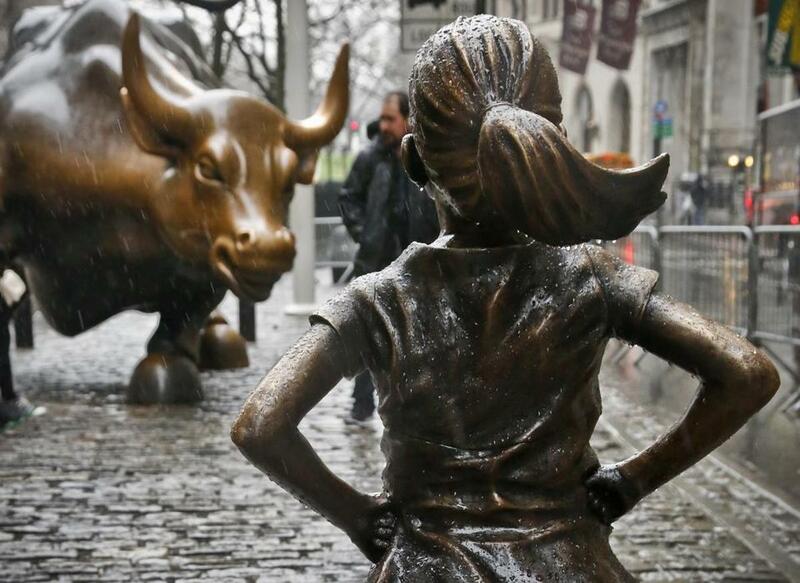 State Street commissioned the “Fearless Girl” statue to promote this new strategy. What do Amazon, Facebook, and Netflix have in common? Not a single person of color sits on their corporate boards. For that reason alone, the Massachusetts pension fund refused this year to support the slate of board nominees recommended by each company. When it comes to diversity in the boardroom, Treasurer Deb Goldberg, who also serves as chair of the state pension board, is taking a hard line. The state’s $66 billion pension fund is a shareholder in about 9,000 companies, and its new proxy voting guideline related to diversity means it voted against or withheld its vote in 69 percent of director elections this year. That’s up from 17 percent in 2012. Goldberg’s message to corporate America is simple: Massachusetts doesn’t tolerate a board whose makeup is less than 30 percent women and people of color. Diversity matters, and study after study shows that different viewpoints are good for the bottom line. About 1,690 companies failed to meet the state’s new criteria on diversity, and many of them are household names: JP Morgan Chase, Hershey Co., Nordstrom, Under Armour, TripAdvisor, and Wal-Mart. Most public companies have at least one woman or minority on their boards. But in 2017, tokenism is no longer acceptable. Goldberg is building on what her predecessor, Steve Grossman, started in 2011. He called it “zero tolerance for zero diversity,” and Goldberg ratcheted it up a notch by setting specific requirements. Calling for 30 percent diversity on a board isn’t an arbitrary figure; that’s critical mass. It used to be if you wanted to take a stand, you would unload your holdings. Goldberg doesn’t think that works anymore. So the pension fund sticks with these companies but sticks it to them through proxy voting. Such shareholder activism is all the rage now, and while the state almost always finds itself on the losing side, this isn’t a lost cause. Goldberg is referring to the wildly successful ride-hailing company and how allegations of a sexist corporate culture ultimately led investors to push out the CEO in June. She’s right. The same shock factor could be used to diversify boardrooms — as in it’s quite shocking that Amazon, Facebook, and Netflix don’t have a person of color on their boards. Amazon declined to comment, while Facebook and Netflix never got back to me. I can only imagine, because there’s simply no good explanation. But Goldberg is hardly going it alone when pushing for more women and people of color in the boardroom. Institutional Shareholder Services, a research firm that advises the Massachusetts pension fund and other large investors, reports an uptick in the number of clients that are focused on board diversity and want help developing voting policies to address the issue. Momentum is building, especially with the industry’s biggest investment firms stepping up the pressure. This year, State Street Global Advisors, which manages about $2.5 trillion, is using proxy voting powers and other methods to lobby for increases in the number of female directors at the 3,500 public companies it invests in. To promote this new strategy, the firm — the investment arm of State Street Corp. — famously commissioned the “Fearless Girl” statue, which stares down the bronze “Charging Bull” near Wall Street in New York City. But the true fearlessness is what happened when State Street began scrutinizing companies for gender diversity. The money manager identified 476 firms in the United States, United Kingdom, and Australia that did not meet its standard and voted against management-recommended directors at 400 of them. “We expect the 76 remaining companies that were screened to show improvement in the area of gender diversity on their boards or we will take voting action in the future,” Rakhi Kumar, head of ESG Investments and Asset Stewardship at State Street Global Advisors, said in a statement. BlackRock, a New York firm with about $5.7 trillion under management, also declared this year that board diversity would be one of its corporate governance priorities. This past proxy season, BlackRock supported eight shareholder proposals on board diversity, and at five of those companies, the money manager voted against the nominating committee members for failing to address investor concerns on board diversity. The gadflies who once badgered companies about corporate governance have gone the way of the stock certificate. Today, as some of the country’s biggest investors step into the fray, it could be obstinate directors whose time is running out.